What did you do with your summer? St. Johns Golf & Country Club member August Kim took home some serious hardware. 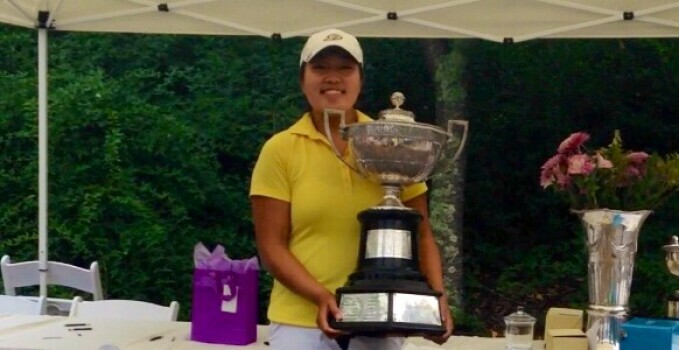 The Purdue sophomore won the 2014 Women's Trans Amateur Championship, played July 29-Aug. 1 at the Members Club at Woodcreek in Elgin, S.C.
Kim went wire-to-wire in picking up the win over the field of 93 players. An opening 69 had her in a position she would never relinquish, some 17 strokes ahead of the cut line heading into the final two rounds. A third-round 70 had Kim well positioned for the victory, though Oregon's Caroline Inglis posted a 3-under 69 of her own to cut the Kim advantage to 2 strokes heading into the final round. A multi-hour weather delay in the final round made for a long day for the remaining field of 62. Wisconsin player Casey Danielson posted a 5-under 67 early to put some pressure on Kim. However, Kim's closing 72 was good enough for the win at 4-under 284. Kim not only won individual honors but also combined with teammate Ashley Yarbrough to earn the Howell Team honors with the lowest school team score. Then Kim made the trek to Nassau Country Club to compete in the 2014 U.S. Women's Amateur. Kim made it into the match-play portion of the competition, surviving 36-hole qualifying at 7 over par. Kim lost in the first round of match play, 3 & 2, to Alison Lee, who wound up falling in the quarterfinal round to overall runner-up Brooke Mackenzie Henderson.